In 1947 Punjab was partitioned into two halves. Millions got separated overnight, and millions lost their lives. This is one of the most tragic incidents of the 20th century. However, on September 2, 2017, defying all the politics and religious lines, Punjabis from east and west Punjab came together to celebrate what is common among them—Punjabiyat (Punjabi-ness), the People, Poetry, Literature, Songs, and Music. 1947 might have been successful in partitioning the Punjab's land, BUT there are over 120 million Punjabis across the world, spread across 160 countries, and Partition failed to separate them. - It failed to take away the ruhaniyat (spirituality) ingrained in all the religions adopted by Punjabis. One of the rare and unique observations is that Punjabis have adopted all the faiths which came or originated in this land of five rivers. Starting with Hinduism, then Jainism, Buddhism, Islam, Sikhism, Christianity, and other faiths have been adopted by Punjabis. Besides all the religious diversity, there is a lot in common among them to be celebrated and cherished. - It failed to reduce the love for the parathas, lassi, and Punjabi cuisine, which is very much relished on both sides. Devinder Singh Johar recited a poem, taking a satirical dig at the appetite of a Punjabi, filling the room with laughter. Chawal and Punjabi chole were served at the event. - It failed to reduce the sweetness of water in the five rivers flowing through the land. Sutlej, Chenab, Ravi and Jhelum flow thru both Punjabs and are lifelines of Punjab and other states. Shivinder Singh recited a poem, sharing an incident on how Sister Fatima directed her sons to ensure safe passage across the Ravi for Shivinder’s ancestors. - It failed to reduce the passion for salwaar-kameez, pagree and Punjabi pehnawa. Salwaar-kameez is still an ethnic wear of Punjabi women and pagree is still worn by men on both sides as a mark of courage, respect, and sovereignty. - It failed to perish the Punjabi language, which is still spoken with similar vocabulary across the Wagah border. Dr. Ganafur, an 85-year old professor who was born in Phillur, East Punjab, spoke in chaste Punjabi and was in tears while sharing his visit to Phillur a few years ago. Sidhu Dumdhami gave a status of Punjabi language and scripts: Gurmukhi and Shahmukhi, written across the borders. - It failed to stop the readers from either side, from reciting poems and reading literature. Sandhya Bhagat recited a poem “Mein tenu phir milangi” written by Amrita Pritam. - It failed to deter singers from either side to sing Heer, Mahiya, Jugnee and many other Punjabi folk songs. Raj Nijjar, a famous singer from Washington D.C., along with Darshan Singh Aulakh, sang couplets from Heer, Mahiya, Perto and other folk songs, and Gagan Singh played the tabla. Anil Bhagat sang a famous Punjabi song “Ki main jhoot boleya.” Jasleen Kaur, a trained singer, sung “Akhiyan ch tu vasda” originally sung by famous Punjabi folk singer Surinder Kaur. Keerat Kaur, a trained singer, who had sung in a Punjabi movie, sang “Mahiya tere pyar” originally sung by Fariha Pervez, a famous Pakistani singer. Hafeez sang a Punjabi song, “Yara sili sili” and a ghazal, “Mere Shauk da nahin aitbaar tainu,” originally sung by Ghulam Ali. - It failed to divide sacrificial-love stories (Sohni-Mahiwaal, Heer-Ranjha). Bollywood and Lollywood (Lahore's film industry) still continue to make movies on these love stories. - It failed to divide bhangra, giddha, jaago, jhumar, luddi, dhamal, and many other dance forms, which are some of the key performances in desi cultural shows. - It failed to reduce Punjabi's love for fun and hilarious expressions of life. Tahir Sayal, Kamlesh Chugh, and Kiran Shaiknag enacted a play, “Interview with Mr. Jarnail Singh and Mrs. Jarnail Singh.” This evoked much laughter. Kiran conducted the interview with wit. 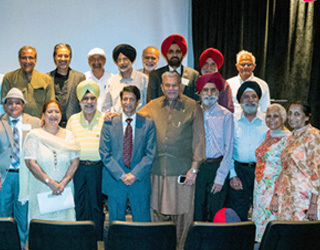 The event was sponsored by Shivamoga Entertainment, Punjab Rang Art, Sikh-American Society of GA, and Sanjha Chulla. “Mere Shauk Da Nahin Aitbaar Tainu”.... Punjabi song by Ghulam Ali.